Johnny Stewart was on target for Portstewart on Saturday. Portstewart kept their excellent form going on Saturday with a superb win over Lisburn Distillery in the Intermediate Cup. 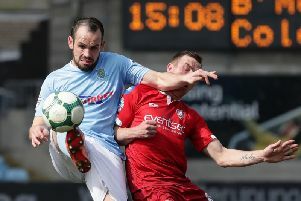 The Ports ran out 5-3 winners over the Whites after extra time at Mullaghacall. The visitors raced into a 2-0 lead before Johnny Stewart pulled a goal back for Gary Taylor’s side just before half time. And they were to level things up in the second half as Karl Steele made it 2-2 after Distillery failed to clear from a corner. It looked as though The Whites had stolen it though as Young put them back in front again. But the home side weren’t prepared to lie down and tied the game up again at 3-3 thanks to an own goal in injury time. That took the game into extra time and Portstewart were clearly buoyed by their late leveller. They edged in front for the first time in the first period of extra time thanks to Ryan Doherty. The visitors suffered a further blow as they lost keeper Jack McCrae to a head injury. Distillery piled forward in the second period looking for the equaliser but they were punished further as Chris Hanson slotted home a fifth for the home side. It was no more than they deserved for another excellent performance. Whites stopper Jack McCrea had to be taken to hospital following concussion suffered during the game but the good news is Jack is now well on the road to recovery. Meanwhile Glebe Rangers progressed in the O’Gorman Cup with victory over Brantwood. Both teams had a chance or two to score before Mark Rainey put Brantwood in front in the 31st minute. Brantwood then went down to ten men in the 33rd minute after having a player sent off. Half-time was almost reached when Chad Dobbin scored the equaliser for Glebe on 42 minutes. The second half saw Glebe exploit the extra man and this paid off when Dobbin scored his second goal of the game in the 60th minute which at the end took Glebe into the next round of the competition.